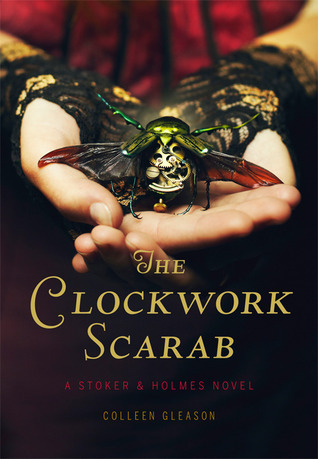 The first is The Clockwork Scarab by Colleen Gleason. I picked this up from a free shelf at the airport a couple of months ago and the title alone had me from hello. Then, I read the description and discovered that the two main characters were a Stoker and a Holmes and that was it. It left the shelf and went with me. This book was fun to read. The characters were easy to relate to and while I've seen it said that Mine especially seemed judgmental for someone who was supposed to be brilliant, I have to say that it seems very much within a teenage girl's personality. Just because you're brilliant doesn't mean that you don't sometimes make assumptions. Aside from all of that, the story is very much plot driven and it's a plot that had me picking the book up whenever I had a few minutes to squeeze in some reading. This book is a steampunk novel and while I don't mind that per se, I did mind that the author reminded us of it every other page or so. It wasn't necessary to the story building. The book also felt slightly unfinished. We don't know who was behind what was happening. We don't really know why the time traveling character was brought there or if he ever made it home. I know that this is book 1 of a 4 part Holmes/Stoker series so I'm hoping that the author revisits these in future books and resolves them. Overall, this is a really fun book. It's certainly geared towards the teenage set, but as a not quite a teenager anymore, I enjoyed reading it and I'm going to try to track down book 2 to see what happens with this pair next.